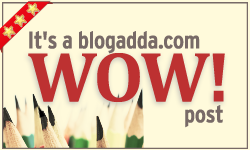 This got selected by Blogadda as a WOW post! This happened a couple of years ago during my tenure as a police officer in a small town near Guwahati, Assam. Sometimes what seems true is far from it and only a deep investigation will lead you to the core of the crime. It involved a twenty year old girl, Arunima, who had gone missing suddenly. There was no suspicious trail of events. Involvement of a possible boy-friend was also ruled out as per the testimonies of her classmates. She belonged to a lower-middle class family and was apparently a studious girl whose life revolved around classes, college and home. She also did not seem to have many friends in college. The family was distraught. She was their only child. The father was a retired teacher who earned a measly income through tuitions and the mother pitched in by sewing embroidery work on hand-woven cotton fabric. They had put in all their hard earned savings to educate Arunima. She was about to start earning in a year's time after graduating from college and they had pinned a lot of hopes on her. According to the mother, Arunima did appear a little worn out since a few days. Upon asking she had dismissed it as being preoccupied with her upcoming exams. The mother found no reason to worry further as Arunima had been a good students and a little anxiety was anyway natural before an exam. That fateful day was no different from any other normal day for Arunima. She had woken up early as usual and left for college. But, she never reached her college. Arunima always took a bus to college. The bus-stand was about 2 kms from her home and she travelled by foot to the bus-stand. The road to the bus-stand was not a busy stretch and also had a small lake that was equidistant from the stop and her home. Police dogs were set hot upon the trail. However, the dogs lost the scent near the lake. It had rained the previous night and it was quite slushy near the water body. We reached a dead end in our investigation. It did seem like Arunima could have slipped and fallen into the lake. The search team was set to fish out a possible dead body from the lake. It seemed like a open and shut case. Somehow, I felt that we were missing something. It did not seem plausible that Arunima could have slipped so much from the main path into the water. Unless she had chosen to be near the lake at that time and then had a accidental fall into the water. Why would she go near the lake at that time and hour? Sent: Meet me at 7 same place. Received: I'm not sure I want to. Sent: Pls, you've to. Let me explain. It was not difficult to then put everything together. The SMSes were exchanged with the same number that appeared more than once in the call registry. The time stamp of the last received message and the time of Arunima's disappearance were not too far apart. We confirmed Arunima's number from her family. It only remained to catch the culprit. It was a case of one-sided love. The boy, Gaurav, had apparently expressed interest in Arunima a month ago but she was not interested. He'd wait for her near the lake everyday and tried to talk to her and convince her. Through his other friends he managed to get her number and called her a few times. Arunima had called up once to express her displeasure and threatened to tell her parents and the police. This explained the number trail in the call-registry. The trail of SMSes was exchanged on the fateful morning. Gaurav was nabbed and charged with murder. He admitted to having met Arunima at the place and time. However, pleaded guilty citing that the fall was indeed accidental and he panicked and ran away and lost the phone in the bush in a hurry. Whether she fell accidentally or was pushed we don't know yet. The sole witness was the calm lake. Linking this to the write over the weekend theme at Blogadda. That was a gripping read. Though it is a story, I feel sad for Arunima and her parents. They suffer for no fault of theirs. How many such real incidents must be happening!! I loved the narration. It was crisp and good paced. Thanks for the encouraging words, Jas! thatz well Said.. good.. Keep sharing Uma .. It made for a good read Uma! Enjoyed your story-telling capabilities! If only people accepted their rejection well. Yes, true, Red Handed. Aren't there so many crimes happening only because someone's ego got crushed because of a rejection? Nice read Uma.. very well narrated! Thank you, Radhika. I'm glad you liked it! You made it look like you really are a police officer. Are you? And is this TRUE or fiction? Haha..am neither a police officer nor is this a true story. Thanks a lot for you kind words, CRD. Will visit your blog too..
Ok, is that book coming out sometime soon ;) ?.. nice one Uma!